This tumbled stainless steel ignition switch bracket is a beefy 1/8" thick, and mounts to either the left or right side of your Harley-Davidson four speed transmission kicker cover. Being stainless steel, you can leave as is, polish, or paint, and never have to worry about rust! Polish it up at it will look as good as chrome. The 'D' shaped hole is a perfect fit for the Lowbrow Customs Weatherproof Starter Ignition Switch (the last ignition switch you should ever need to buy for your bike!) 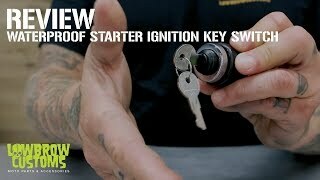 or any other ignition switch with a 13/16 inch body. The D-shaped hole keeps your switch from rotating when you turn the key. Made in Ohio, USA. NOTE: Ignition switch not included, see related products below. Nice part. Does what it's supposed to. Will work fine on my chop. need a place to stick yo ignition in? then get this, it'll slide right in, you can adjust your nut for shallow or deep positioning. i found it easier to position the nut all the way back so you know how deep you can put it in without hitting anything on the back side and causing damage. Das Teil ist super, die Verarbeitung passt. Daumen hoch und vielen Dank fuer die schnelle Lieferung. Best wishes from Germany.